As an exclusive Ceiling Pro practitioner, Penn Jersey can restore your acoustical ceiling to its best. Delivering like-new cleaning quality in a quick and no-mess process, ceiling restoration and recoating with Penn Jersey is efficient, effective and also great value. Your business’ ceiling may not be the first thing you think of when it comes to general premises cleanliness and hygiene but it can and does absorb nasty odors, grease, dirt and even dangerous particles and hazardous substances such as mold. Professional ceiling restoration ensures all odors, grease, and dirt are removed, quickly and efficiently. Explore our Before and After Shots to get a real feel for the quality of our professional ceiling restoration work. As a Ceiling Pro practitioner, Penn Jersey can proudly deliver efficiency and great value professional cleaning services. Rather than considering ceiling replacement or painting, opt for our cleaning process. Save up to 75% on replacement and 50% on paint with our one-coat, no mess process. As well as looking cleaner and being more hygienic, you may find lighting is improved by up to 20% with no need for additional light fittings. Our crews are highly experienced, insured and bonded, delivering a convenient and speedy process to restore your ceiling quality. As well as returning the cleanliness of your ceiling to its best, our process also ensures the acoustic and fire protective qualities of your ceiling are maintained. Our process uses safety tested, biodegradable chemicals with no harmful toxins or bleach. The like-new condition is restored to your ceiling in a quick and efficient manner. At Penn Jersey we work with premises in many different industries delivering our commercial ceiling cleaning service. Almost every building features at least one acoustical ceiling, many of which are probably in need of a clean. 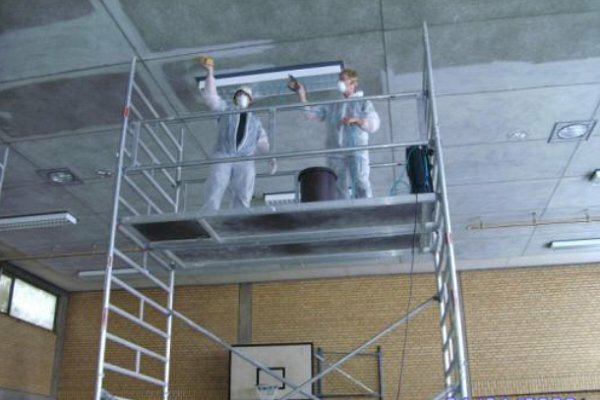 Whether operating a small restaurant, a franchise or a large commercial store or factory, our professional crew can deliver quality ceiling at a time which suits you and your business. Our restoration processes help bring the best back to your premises, ensuring your ceiling looks as good as possible. As well as looking good we ensure that all potential health hazards are dealt with. The grime and dirt that builds up on your ceiling can be unsightly but it can also be a health risk so it should be dealt with properly. Our processes and position as a Ceiling Pro practitioner allow us to deliver the best, cleanest results for your ceiling at a great value price. Full ceiling replacement or retiling is an expensive option when in many cases it is completely unnecessary. What’s more, our cleaning processes maintain the integrity of your acoustical ceiling where painting over them won’t. The tiles are designed to absorb sound but this is lost if you paint over them, as is their fire resistance. An unclean or dirty ceiling can be a real eyesore for your business and it can create a poor first impression. It can also minimise the brightness and airiness of your space, to the extent you may think you need more lighting. Full cleaning services for your ceiling restores their brightness and removes the need for more lighting too. We work quickly and efficiently to bring your ceiling back to its best. To discuss our ceiling restoration and cleaning processes in more depth, get in touch today.